This has been a very interesting year in the Cloud Computing field in general, and in OpenNebula in particular. It looks like the field is consolidating, and we are past the Peak of Inflated Expectations slowly moving into the Plateau of Productivity. This can be inferred from the increasing number of enterprises that are implementing their in-house private clouds and offloading their computing needs to public cloud providers, showing that the paradigm did take off and it’s soaring towards computing efficiency. In this regard, we are proud that OpenNebula celebrated this year its 8th anniversary, showing a degree of maturity fit for the most demanding production environments. The OpenNebula project is proud to deliver a truly open, vendor-free, user-driven software to build private and hybrid clouds, with design principles that focus on simplicity and flexibility. Our philosophy is not to break with the previous outstanding work in datacenters, but rather extending its functionality to take advantage of the cloud computing benefits. We think this is a unique vision in the field, and OpenNebula is the product of this believe. With 2015 coming quickly to a close, we’d like to review what this year has meant for the OpenNebula project. You have all the details about the great progress that we have seen for the OpenNebula project in our monthly newsletters. Two major releases were published this year: 4.12 Cotton Candy and 4.14 Great A’Tuin. Moreover, three maintenance versions were released to fix bugs and polish features. Several maintenance versions of AppMarket were also released. One of the main focus of 4.14 Great A’Tuin has been the Sunstone interface, which has been completely refactored for maintenance and performance reasons. However Great A’Tuin is probably the release of OpenNebula to date that features more new functionality. GPU support is a great addition to support HPC oriented infrastructures, importing existing running VMs into OpenNebula for all supported hypervisors (including the public ones), fully supported disk snapshots for Ceph and qcow2, image resizing, ability to ability to save VMs into VM Templates for later use, flexible context definition of network attributes, the list goes on and on. We feel this is the most mature and rich OpenNebula version, but we are not stopping here since work towards 5.0 has already started. Moreover, four major releases of vOneCloud were released this year. Thanks to the amazing user feedback, the a virtual appliance for vSphere that transforms an existing vCenter deployment into an automated, self-service private cloud in a few minutes, is quickly growing its feature set to deliver a reliable, robust and mature product. vOneCloud exposes a multi-tenant, cloud-like provisioning layer, including features like virtual data centers, self-service portal, or hybrid cloud computing to connect in-house vCenter infrastructures with public clouds. vOneCloud seamlessly integrates with running vCenter virtualized infrastructures, and can be set up if a few minutes and import the existing infrastructure resources, including running VMs. We would like to thank the community members that have contributed with patches, documentation and feedback to the matureness of OpenNebula. Also, to the various organizations that have contributed to enhance OpenNebula through the Fund a Feature program: Blackberry, Echelon, Unity, BIT.nl, SURFsara and the Université Catholique de Louvain. We look forward to your contributions to code development!. The OpenNebula community is as healthy as ever, and fastly growing. The contributions to the software and its roadmap are vast, and cannot be briefly mentioned. We wanted to highlight a few integrations and feature extensions though, like one onesnooper, StorPool, Vagrant, LXC, nodejs binding, Saturnring, Kerberos, Chef, CloudVAMP, Docker, ZFS, and many many more. We are proud of our very much alive, proactive and engage community! There are tens of thousands of deployments around the globe and OpenNebula is parked in some of the biggest organizations out there including Industry and Research leaders. OpenNebula roadmap is defined by its users needs. We just performed a survey to require input for the list of features that will be tackled for the next major update, OpenNebula 5.0. 2015 also marked the end of the distribution mailing list as the main mechanism of communication with our community, in favour of the new online forum, to keep this communication agile and fruitful. We would like to thank all our users! It is out of scope to name all new users, but we want to give a wholeheartedly warm welcome to those new users that shared their experiences through our blog: Unity, Universidad Politécnica de Valencia, PTisp, Avalon, China Mobile, Rentalia and BIT.nl. If you are using OpenNebula, you are very welcome to contribute your integrations and experiences by writing a post in our blog or submitting your integration to the OpenNebula Add-on Catalog. Spreading the OpenNebula word is of the uttermost importance for the project. The brightest highlight is, as usual, the OpenNebulaConf 2015. 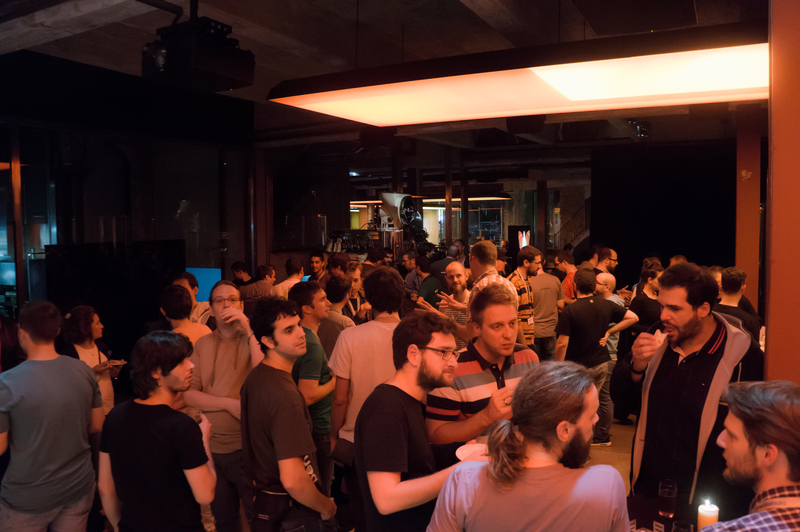 This year it was held in slick hotel Barcelo Sants in Barcelona and featured very interesting talks by relevant users: Runtastic, Unity, Citrix, RedHat, Fermilab, … Check out the videos, slides and pictures to get a glimpse of what you missed. A lot of new ideas for features and collaborations were fostered in this event, so expect a great and fruitful 2016. In 2015 members of the OpenNebula team participated in several around the world. We want to highlight the VMworld Europe 2015 in Barcelona, Cloud Expo Europe in London and the Open Cloud Day in Bern. These events are great opportunities to evangelize people into what we think is the greatest Cloud Management Platform. A number of high quality OpenNebula TechDays, full day events to learn about OpenNebula with a hands-on cloud installation and operation workshop and presentations from community, were held this year. Check out the agendas of the Prague, Boston, Paris and Ontario TechDays. We want to thank all organizations that hosted a TechDay in 2015 for their hospitality. We are organizing the schedule of TechDays for future months, send us an email or send it to the community discuss mailing list if you are interested in hosting a TechDay event. We also look forward to proposals to create a user group in your area. In a few days we will announce OpenNebulaConf 2016. We are thrilled to have a community as vibrant and engaged as the OpenNebula one. 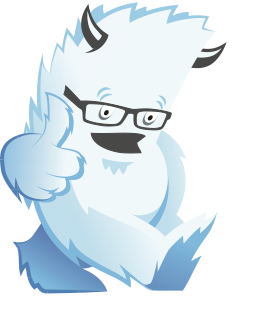 Two thumbs up to you all for helping us building a great cloud management platform that solves real world problems. We’d also like to take this opportunity to wish you happiness and prosperity in 2016 to you and your loved ones! The OpenNebula team is waving goodbye to 2015. This year the OpenNebula project has turned 8 years old, and we are proud to see the matureness of the software and how is helping people around the world to create private and hybrid production clouds. Happy new year dear community! As you may know, in the OpenNebula project we value our users feedback. Since 5.0 is going to be a very important milestone in the project, we wanted to know your opinion before defining the roadmap. For this reason, we did a survey to gather your opinion regarding OpenNebula and its features. We received a huge amount of feedback, which is proving immensely values to shape OpenNebula according to its user needs. Thanks again for your engagement with the project. One of the great assets of OpenNebula is its customization capabilities. Its modular architecture widens the integration range with different datacenter components. We wanted to flexibilize Sunstone as well, to offer the end users the functionality emerging from such integrations, and thus we have written a Sunstone development guide. We are sure this will open the door to richer clouds based on OpenNebula. We know that creating images for any cloud can be a hard task. In order to lower this barrier to allow for a wider range of applications available in all OpenNebula clouds, we created a guide to aid customizing images based on libguestfs. If you are building or operating an OpenNebula cloud, it may be worth checking. Producing quality ecosystem components for OpenNebula is a great addition to the project. But if you top it with an excellent post describing the new component and how it interacts with and what value bring to OpenNebula, then you deserve a big thumbs up! In this case, we are talking again about our friends at Universidad Politécnica de Valencia and their recent addition, CloudVamp, which adds automated oversubscription and dynamic memory elasticity for OpenNebula. Don’t remember the guys from Universidad Politécnica de Valencia? They are the authors of the ONEDock, an exciting approach to Docker integration. A new addon component for the ecosystem brings ZFS support for OpenNebula clouds. This is a great addition that we are sure will interest the OpenNebula users. Another great, great addition to the OpenNebula capabilities is this LXC addon, which this month enters officially into its first stable release. Great job guys!. As usual, we blush with our community comments. This time, the feature to blame is the easiness of deployment of an OpenNebula cloud. We work hard towards this goal, and it is very rewarding to learn that this is not a work that is taken for granted. In case you missed it, we wanted to highlight this excellent post by Florian Hettenback, analyzing the OpenNebula characteristics. We do not speak german, but we liked what we understood from the translation. As usual, we want to mention the efforts the community undergoes to maintain the ecosystem up to date. Way to go! We really appreciate it. This month we learned about a new version of the OCA (OpenNebula Cloud API) python binding and the release of version 0.4 of the OpenNebula-Foreman integration. Thanks!. In case you didn’t have the chance to review the material for the third edition of the third OpenNebula Conference, you have the chance to watch the talks in our YouTube channel, download the slides from the slideshare account or take a look to the pictures of the conference. Now is the time of the year were the team plans the events for 2016. We will shortly unveil our plans for the next, fourth OpenNebula Conference. Stay tuned! In this very same line, we are defining location and dates for 2016 TechDays. The OpenNebula Cloud TechDays are full day events to learn about OpenNebula with a hands-on cloud installation and operation workshop, and presentations from community members and users. TechDays hosts have an important role, and that is the local promotion of the event to gather OpenNebula enthusiasts in this technical event. If you are interested, please let us know. If you are interested in receiving OpenNebula training, check the schedule for 2015 public classes at OpenNebula Headquarters. 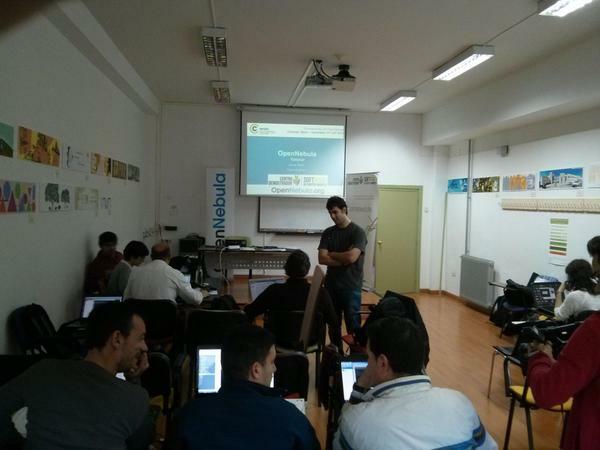 Next public OpenNebula training will take place next 15th of December in Madrid. Please contact us if your would like to request training near you. In Cloud Management Platforms users typically deploy their VMs out of pre-defined templates that can specify a fixed amount of memory. Users may be able to customize the size of their VMs but they tend to overestimate the memory required for their applications. As an example, three 4 GB VMs with applications actually using 1 GB of RAM fit in a 12 GB node, but there is no more room left for additional VMs. Adjusting their memory to 1 GB VMs enables to deploy additional VMs on that node, as shown in the next figure. CloudVAMP is an open-source development that manages these situations for all the nodes in an OpenNebula Cloud deployment based on the KVM hypervisor. CloudVAMP monitors the memory usage of Virtual Machines (VMs) and dynamically changes the memory allocated to VMs by stealing the unused free memory from VMs. Then CloudVAMP enables OpenNebula to use that stolen memory, thus being able to increase the VM-per-node ratio. 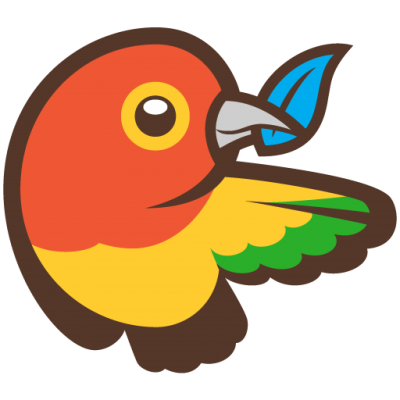 To prevent memory overload in the physical hosts, live migration is applied in order to accommodate the increasing memory demand by VMs across the OpenNebula Cloud. Cloud Vertical Elasticity Manager (CVEM). An agent that analyzes the amount of memory actually needed by the VMs and dynamically updates the memory allocated to each of them, according to a set of customizable rules. The Memory Reporter (MR). An agent that runs in the VMs and reports to the OpenNebula monitoring system the free, used memory and usage of the swap space, by the applications in the VM. The Memory Oversubscription Granter (MOG). A system that informs OpenNebula about the amount of memory that can be oversubscribed from the hosts, to be taken into account by the OpenNebula scheduler. Deploying CloudVAMP in an OpenNebula Cloud enables to seamlessly allow OpenNebula to deploy more VMs per physical host, thus achieving increased server density. The memory usage of VMs is monitored in order to satisfy increased memory demands by the applications running in the VMs. The usage of live migration to redistribute the VMs without downtime is employed if necessary, without any user or sysadmin intervention. This enables an increased usage of the hardware platform that supports an OpenNebula Cloud. In particular, at the GRyCAP research group we have integrated CloudVAMP in order to accommodate a larger number of incoming jobs from the ES-NGI (the Spanish National Grid Initiative) that are executed on a virtual elastic cluster deployed and managed by EC3 (Elastic Cloud Computing Cluster). The virtual cluster, deployed on top of our OpenNebula Cloud, is horizontally scaled whenever incoming jobs are received (i.e., deploying additional Worker Nodes (WNs)) and vertically scaled (i.e., adjusting the allocated memory to the VMs) in order to let OpenNebula deploy additional WNs in the same host, if necessary. Further details of this case study are available in CloudVAMP’s reference publication. CloudVAMP has been developed by the GRyCAP research group at the Universitat Politècnica de València. It is available under the Apache 2.0 license at GitHub. Germán Moltó, Miguel Caballer, and Carlos de Alfonso. 2016. “Automatic Memory-Based Vertical Elasticity and Oversubscription on Cloud Platforms.” Future Generation Computer Systems 56: 1–10. http://linkinghub.elsevier.com/retrieve/pii/S0167739X15003155. Contributions, feedback and issues are very much welcome. In OpenNebula 4.14 the graphical interface code, Sunstone, was redesigned and modularized to improve the code readability and ease the task of adding new components. HTML code is now defined in separate files using Handlebars templates. Zurb Foundation is used for the layout of the web. 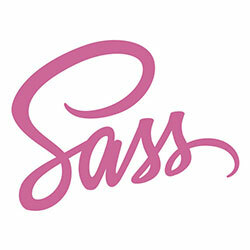 Additional CSS styles are defined using SASS. 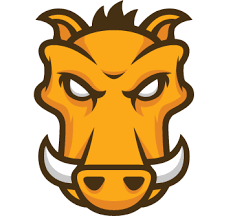 Grunt is used to automate the different processes to generate the optimized files. We have included a new Sunstone development guide, including more details of this implementation and how to apply changes to the new code. Besides our annual OpenNebula Conference, we are planning to organize Technology Day events in multiple cities globally during 2016. For more information on past events, please visit the Cloud Technology Days page. These are not for profit events, all funds raised are rolled into the OpenNebula promo fund and will be used for further OpenNebula TechDay Events. ONEDock is a set of extensions for OpenNebula to use Docker containers as first-class entities, just as if they were lightweight Virtual Machines (VM). For that, Docker is configured to act as an hypervisor so that it behaves just as KVM or other hypervisors do in the context of OpenNebula. The underlying idea is that when OpenNebula is asked for a VM, a Docker container will be deployed instead. In the context of OpenNebula, it is managed as if it was a VM, and the user will be able to use IP addresses to access to the container. Docker Machine and similar projects deploy VMs in different Cloud Management Plattforms (e.g. OpenNebula, OpenStack) or commercial providers (like Amazon EC2), installing Docker on them. Afterwards, it is possible to deploy and manage Docker containers inside them, using the Docker client tools that communicate directly with the Docker services deployed inside the aforementioned VMs. Instead, ONEDock takes a different approach by deploying Docker containers on top of bare-metal nodes, thus considering the containers as first-class citizens in OpenNebula. This allows to seamlessly integrate the benefits of Docker containers (quick deployment, limited overhead, availability of Docker images, etc.) in a Cloud Management Platform such as OpenNebula. On the other side, it provides new features for containers that are usually reserved for VMs (e.g. enhanced IP addressing, attachment of block devices, etc.). An image is registered in a datastore of type ‘onedock’, by using the oneimage command. ONEDock will download the image from Docker Hub. A VM that uses an image registered in the ‘onedock’ datastore is requested. When the VM is scheduled, ONEDock will actually create a Docker container instead of the VM, and the container will be daemonized (e.g. kept alive). If the container has been connected to a network, it is possible to be accessed (e.g. using ssh or http). The most prominent feature of ONEDock is that it does not introduce any API changes, therefore it does not modify the way of interacting with OpenNebula: It is possible to use the ONE CLI (i.e. oneimage, onevm, onetemplate), OpenNebula Sunstone, XML-RPC, etc. 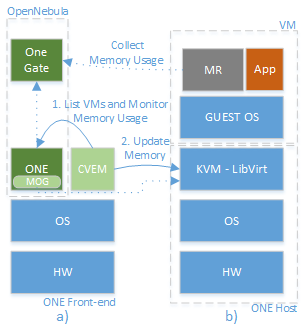 and keep the usual lifecycle for the VMs. ONEDock Datastore, that enables to create a datastore that contains Docker images. It is self-managed in the sense that images are created as references that are automatically downloaded from Docker Hub. ONEDock Transfer Manager, that stages the docker images that are in a Docker datastore into the virtualization hosts. ONEDock Monitoring Driver, that monitors the virtualization hosts in the context of the Docker hypervisor. ONEDock Virtual Machine Manager, that carries out the tasks related to the lifecycle of the Docker containers as if they were VMs. These components have to be installed in the proper folders of a ONE frontend (i.e. /var/lib/remotes/) and activated in the oned.conf file. Therefore, no source code modifications of OpenNebula are required. Once this has been done, it is possible to create datastores of type ‘onedock’ and virtualization hosts that use ‘onedock’ as the virtual machine manager. In order to deploy a Docker container, a Docker image is required. When you run a container, Docker automatically retrieves the image from the Docker Hub repository. To avoid that all virtualization hosts access Docker Hub, and as kind of cache, ONEDock supports a private registry installed in the OpenNebula front-end. Then, the references to the Docker images will point to the private Docker registry. ONEDock supports Docker registry v2.0. Docker containers are conceived to run applications, and so, it is common to find that ports are redirected to public ports in the machine that hosts the Docker container. ONEDock enhances this behaviour in order to expose all the ports of the container as it would happen in a VM. Therefore, you can run different services in different ports without the need of exposing them explicitly. The container will have an IP address where all the ports are available. Spin up the vagrant VM, which will be automatically configured with ONE, ONEDock, the docker registry and all the needed components. Create a testing container (using a self contained cli-utility that installs ONE, ONEDock, the docker registry and all the needed components). ONEDock has been developed in the framework of the INDIGO-DataCloud (https://www.indigo-datacloud.eu) project under the Apache 2.0 license. You can get it from the public repository https://github.com/indigo-dc/onedock. ONEDock is accepting contributions. You are invited to interact with us in the GitHub repository, by asking questions or opening new issues. We are very proud to celebrate the 8th birthday of the OpenNebula Project. Eight years developing OpenNebula has been a great adventure and experience for the OpenNebula project, and we are sure that it has been also a great ride for you. Thanks for being such an excellent open source community! The team has released this past month a new maintenance release for Great A’Tuin, the 4.14.2. This release comes with several bug fixes found after the 4.14 release. These bug fixes cover different OpenNebula components like the Cloud View self service portal, Sunstone web interface, OpenNebula Core and several drivers (VM, IM, Network, Auth), as well as with the OneGate component. Check the full list of bug fixes in the development portal. This maintenance release also includes several improvements in several OpenNebula components. Cloud View and Sunstone have very interesting new features that boost usability and productivity, whereas other areas have been improved for security and reliability. vCenter integration has also received its share of love, with interesting new features like VMware Customization spec support. Check out the full list of improvements introduced in this release in the documentation. A new version of the AppMarket, 2.1.0, has also been released. This new version solves issues reported by the community and has been verified to work with OpenNebula 4.14.2 and the new Sunstone design. And last, but not least, new version of the context packages has been also released. This new version of the packages come with new features like support for contextualization in EC2 VMs (yay! ), OneGate token for vCenter and EC2 VMs, and better SSH configuration support. From now on the context packages are splitted in two, the version for KVM, XEN and vCEnter and other for EC2 instances. The project is also committed to produce needed documentation to aid users designing and building their clouds. In this regard, it may be of your interest the new VMware Cloud Reference Architecture, to define our recommendations to build private and hybrid clouds on top of vCenter infrastructures. There are amazing projects featured by the OpenNebula community. We want to let you know about these quality projects in this section, as we are sure they might be of your interest. Our friends at Universidad Politécnica de Valencia are producing great tools for OpenNebula. For instance, CloudVAMP, a vertical elasticity oversubscription manager for OpenNebula. Check it out if you want your VMs to adjust their capacity automagically!. Another great contribution from them is ONEdock, a set of drivers for OpenNebula to enable the use dockers as if they were virtual machines. Support for new storage backends is a much welcome addition to OpenNebula, like this new ZFS driver for OpenNebula, enabling the the possibility of using ZVOL volumes instead of plain files to hold the Virtual Images. Documentation is a great asset, often underestimated. We want to a big thanks to Adrian for their OpenNebula tutorial in spanish, very useful to foster OpenNebula adoption. Also important for adoption is the ability to roll out OpenNebula easily. That’s why we also want to endorse initiatives like this new Chef cookbook for OpenNebula. Thanks! It is very important to maintain the OpenNebula ecosystem up to date!! That is why we love the work by our community, like for instance the StorPool driver which is now up to date for OpenNebula 4.14.2. Good work! 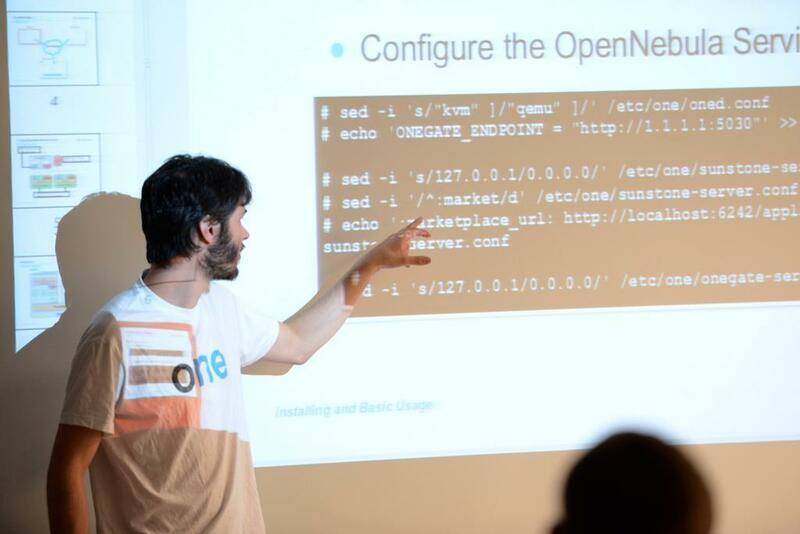 The third edition of the third OpenNebula Conference was a great success! Three days packed with interesting talks and great experiences exchange. It was a great success thanks to the support and participation of all of our community members, speakers, sponsors and friends. If you missed the conference, now you have a chance to watch the talks in our YouTube channel, download the slides from the slideshare account or take a look to the pictures of the conference. We would like to take this opportunity to thank again our Platinum Sponsors PTisp and StorPool; Gold Sponsors ungleich (check out their summary of the conference), Xen Server and NodeWeaver; and Silver Sponsors Runtastic and No Limit Network. One of our sponsors, ungleich, organized this past month an OpenNebula workshop in Digital Glarus, at their enviable location in Switzerland. We are very happy the word is getting out there. There is a CfP that we want to highlight for a DevOps meetup in Italy. If you are interested in giving a talk or attending, check out their web page. Moreover, we would like to highlight the CfP extension to the FOSDEM16 Virtualization & IaaS DevRoom, if interested in sharing your OpenNebula experience you can send a proposal.